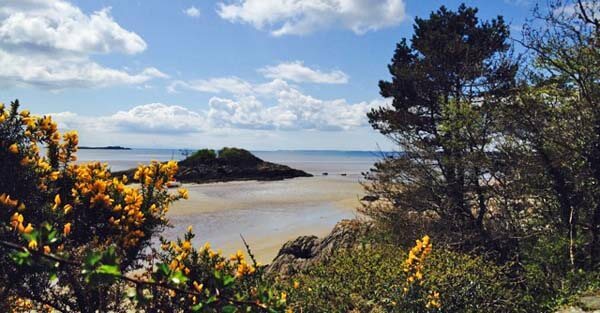 Warmed by the Gulf Stream, Galloway's sandy beaches in the far west can boast palm trees and more exotic plants can be found in its many open gardens. Tackroom Cottage offers an ideal base to explore this forgotten corner of Scotland. If it is outdoor activities you enjoy then Galloway can provide something for everyone, from coastal and forest paths, cycling and climbing, to everything in between! Food foraging, fishing, bird watching, deserted beaches, golf, mountain biking - Kirroughtree 7Stanes Trails, hill walking, spectacular water sports (sailing, canoeing, skiing, windsurfing), photography, clay pigeon shooting, archery or for those looking for an adrenaline fix, the Human Slingshot, Zip Wire and Segway are also available. A variety of quality local farm produce; Galloway Belted Beef, Cairnsmore Cheeses, Cream of Galloway ice-cream, the Cocobean chocolate, Chilli Jam, Salt-Marsh lamb or fresh seafood and venison from the Galloway Smokehouse along the road makes this an area of gastronomic delights. Don't forget to try the regional Whisky (Bladnoch and Annandale distilleries) and our local Galloway beers (Sulwath, Portpatrick, Five Kingdoms and Madcap micro breweries). The Southern Uplands are some of Scotland's least discovered hills and offer excellent walks of varying difficulties, but don't let the names put you off: The Murder Hole, Grey Man of Merrick, Devil's Bowling Green, Nick of The Dungeon, Rig of the Jarkness, Rhinns of Kells, The Silver Flowe. The Merrick, just below Munro status, is Scotland's most southerly Corbett and a popular ascent. It neighbours the 'The Range of the Awfu' Hand' a remote area of Galloway. You can spend hours in the hills and not meet a soul, but if you're lucky you may see a Golden Eagle! The cottage is also ideally located as a base for walking the western sections of Southern Scotland's coast to coast footpath, the Southern Upland Way. The owners are themselves experienced hill walkers and happy to advise. If you prefer a slower and more relaxed pace on your holiday, take a forest drive or a trip along the Solway coastline to the Mull of Galloway, Scotland's most southerly point. Explore the local market towns and quaint villages, including the 'themed' towns of Wigtown - The Book Town, Castle Douglas - The Food Town, and Kirkcudbright - The Artist's Town. The network of roads and lanes are not as busy as in the Lake District, but only 20 miles away from them across the Solway Firth. Free Wifi - rural speed! Tackroom Cottage, you'll not be surprised to hear, was once the Tack Room for the Cairnsmore Estate stable block. It is easy to imagine the horses being led through here when you see the oversized door that leads to the garden. On entering the cottage from the courtyard, a wide hallway welcomes you. The bright bathroom has a bath with overhead shower and offers plenty of storage for your personal items. The kitchen is well appointed with dishwasher, washing machine, cooker, integral fridge and freezer and microwave. It overlooks the garden that is separated from the cottage by a track. Opposite, one step up leads to the spacious lounge-diner. This is a double-aspect room with sash and case windows. Two comfortable sofas and pictures from local artists add to the homely feel of the room. A 50-inch television invites you to relax in the evening after a day on the hills or exploring the surrounding area. Freesat and a small library of DVDs are provided. The oak dining table is situated overlooking the garden. A separate dressing room with an antique wardrobe and chest of drawers guides you into the bedroom with a comfortable double-sized Edwardian bed. Egyptian cotton bed linen and towels are provided. Both rooms are wood-panelled. The bedroom also houses the original (non-working) range. From the hallway a steep flight of stairs gives access to a snug - a lovely cosy area with a day-bed and small collection of books where you can while away a few hours in peace and quiet. Outside the unusual garden houses 2 granite-columned hay barns, a rare example of these paired structures. A gas-fuelled BBQ is housed underneath one, offering outside dining whatever the weather! There are also two small lawned areas, one especially offering a private walled-garden atmosphere to sit and enjoy the sunny days and in the evening a place to watch the bats living in the eaves of the hay barns come out to play. Travelling from the east or south, by-pass Dumfries driving along the A75 towards Stranraer. The estate is 5 miles before Newton Stewart, approx. 1h from Dumfries. From the north-west, A714 via Girvan or the A712 through New Galloway to Newton Stewart. Sat changeover: 10:00 check-out and 16:00 check-in. Short breaks when available, minimum stays 3 nights. 1. Climb Cairnsmore, the most southerly Graham in Scotland, from the back door....or as one of our guests described it...the hill in the back garden!...and view 'the 5 Kingdoms' from the summit. 3. 'Walk or cycle along Bargaly Glen to the Duke's Pool....if you're lucky you'll have the sole use of this natural Pool with built-in 'jacuzzi', a great place for a picnic and swim. Tackroom Cottage is a historic self-catering cottage and a perfect base from which to explore the Galloway countryside with its beautiful beaches, empty hills and pretty market towns.